We are offering a vast collection of Mouth Wash Bottle to our valuable clients that are widely appreciated among our clients due to their diverse and unique features. In order to stand these bottles perfect on industry quality standards, offered products are tested by our quality examiner based on varied quality aspects with the help of advanced tools and technology. 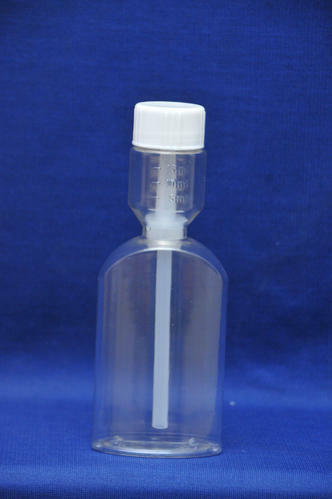 In addition, clients can avail these bottles from us at industry leading prices. Incepted in the year 1970, we, Plastopack Industries, are one of the leading manufacturers, suppliers and exporters of various types of Plastic Bottles & Containers. Under this, we offer Dropper Bottles, Nasal Spray Bottles and Shampoo Bottles. Our offered products are in high demand due to their durability, modern design, superb look and crack resistance properties. Moreover, our revolutionary business ideas along with customer-friendly approach have enabled us to establish a remarkable image in this competitive market. Our company has a state-of-the-art infrastructural unit that covers a vast area and is equipped with latest machines and tools. For manufacturing eye drop bottles, we have installed imported IBM machines with a WHO system. The infrastructure of the company is divided into different sections such as manufacturing unit, quality testing unit and warehousing & packaging unit. Our products are manufactured by using optimum grade raw materials that are procured from trustworthy vendors after conducting in depth research by our skilled procurement agents. All the stages of production from manufacturing to dispatch are strictly supervised by our highly qualified quality controllers at our in house quality testing unit. In addition to this, our spacious and sound warehousing facilities are capable of storing the products in a secure manner. We are exporting our products in all over the world.